Entrance to the Sita Bangira (Sitabenga) Cave, Ramgarh, Chota Nagpur. bl.uk > Online Gallery Home	> Online exhibitions	> Asia, Pacific and Africa Collections	> Entrance to the Sita Bangira (Sitabenga) Cave, Ramgarh, Chota Nagpur. 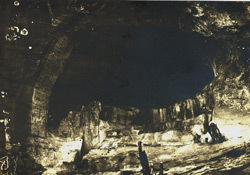 Photograph of the Sita Bangira (Sitabenga) Cave, Ramgarh taken by Joseph David Beglar between 1874 and 1875. Beglar at that time describes the location as "a large cavern high up in the rocks, 45 feet deep and six feet high at the entrance...The cave is approached from below by semi-circular steps and contains numerous Brahmanical sculptures, one of which is inscribed." The cave is an oblong shape with two benches running along the back wall A number of steps have been carved into the rock in quite artistic fashion and Beglar observed that within the cave rested a number of sculptures or Brahmanical deities such as Hanuman and Parvarti. The caves walls while not sculpted are smooth and retain some traces of painting.